A Coventry man has denied allegations that he is running an Italian restaurant from his terraced home, despite the property having several large signs promoting the tiny bistro and its food. Luigi Casselero insists that the 3 bedroom £160,000 property is simply the home he shares with his wife and two daughters and that it is definitely not a restaurant. 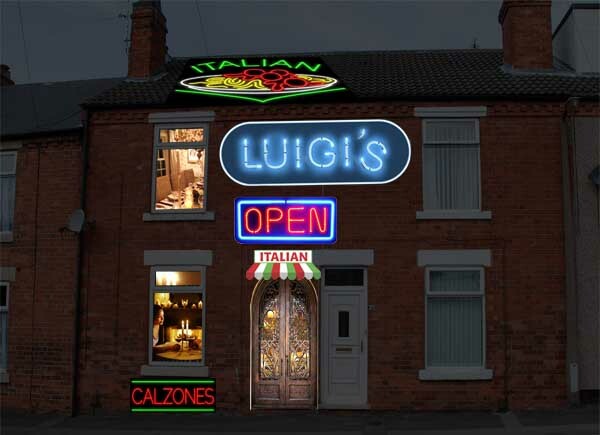 A large neon ‘Luigi’s’ sign hangs above the front door, coincidentally also the name of a restaurant that Mr Casselero ran in Sicily before moving to the UK in 2016. When we called, Mr Casselero opened his door to us wearing a striped apron and a chef’s hat. Further investigation by Spoofflé revealed that Luigi’s has a web site with menus, Facebook and Instagram pages and runs regular half-page advertisements in the weekly local paper. Coventry City Council have been investigating the premises over an alleged breach of planning regulations but so far say they have no evidence and have been unable to reach a decision. This is in spite of making numerous visits in pairs, with some Saturday evening meetings apparently having to last up to four hours.